At the turn of 1985, Tharg the Mighty began to plug his "Master Plan". Readers were left to ponder what this might be (an impending merger? A spin-off comic, possibly starring Judge Dredd? 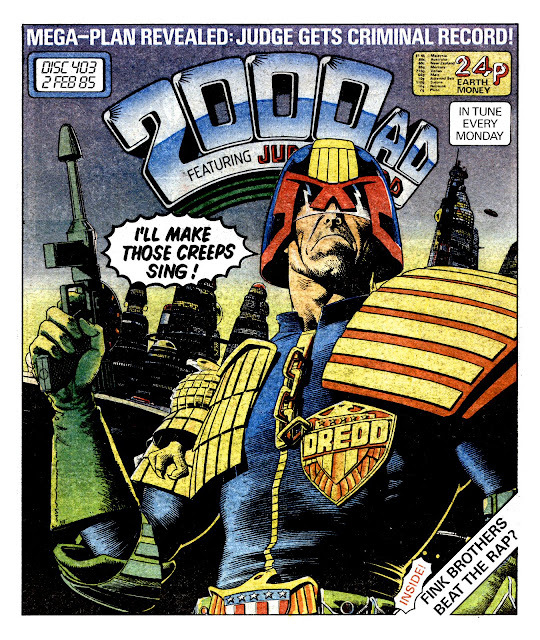 Or, possibly, the long-discussed Dredd movie?). Finally, all was revealed in Prog (or was that Disc?) 403, on sale in Earth's newsagents in the last week of January. The fearsome Fink Brothers, hitherto not noted for their musical talents, had made a single. 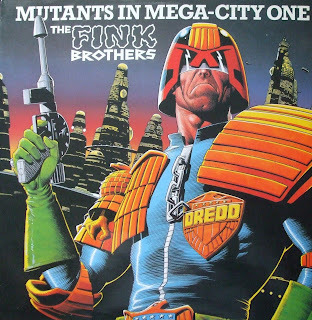 Of course, these muties from the future were really moonlighting musicians Suggs (aka Fink Angel) and Carl Smythe (aka Mean Machine) in some novelty green make-up (making them look like sickly cybernetic versions of WORZEL GUMMIDGE). The Mighty One (no stranger to green), clearly sensing a chance to repel Thrill Suckers (and get some free publicity for the Galaxy's Greatest Weekly), fully endorsed this escapade. 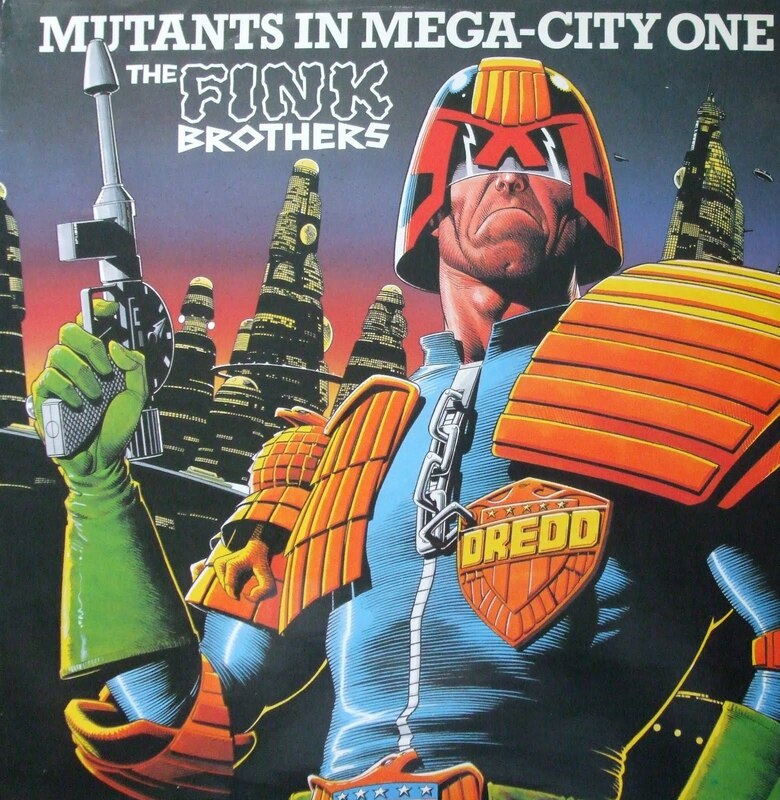 Brian Bolland's iconic artwork (which, according to his book, he never got back) for the single, picture disc and promotional poster also graced the cover of Prog 403. The shameless pop chancres also made a couple of TV appearances. 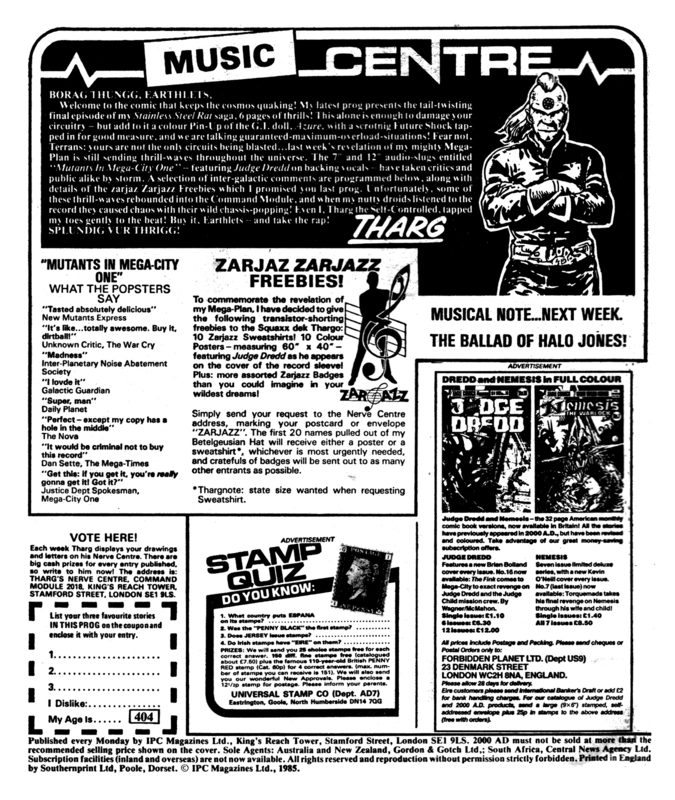 TOP OF THE POPS was clearly booked but (inexplicably) BBC Manchester's OXFORD ROAD SHOW (by now renamed the "funky" ORS 85 - and about to be cancelled) took the bait along with Central Television's networked ITV Saturday morning kids show SATURDAY STARSHIP (also about to be cancelled. You can almost see a pattern here...). The single troubled the chart for four weeks, rising for two weeks before dropping and then vanishing. TX DATE Saturday 26 January 1985. 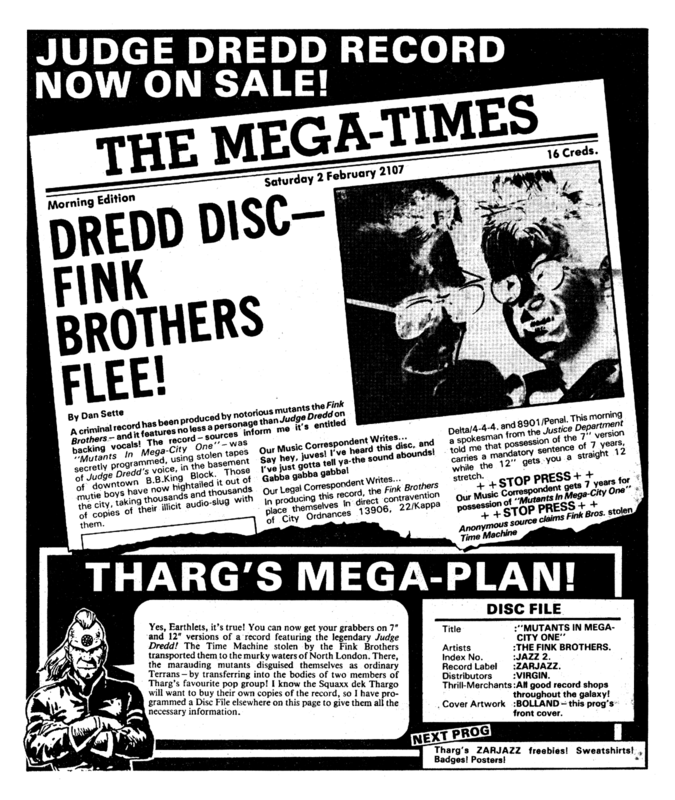 Extract from video followed by live studio appearance by the Fink Brothers. This was the last episode of the series and the Brothers were seen to take part in the (unscripted?) demolition of the show's set.